GUEST BLOG / By the Editors of West Coaster Craft Beer News & Website--The craft-brewing industry is in a state of flux, forcing companies within it to reexamine their business models and, in the case of larger operations, alter them in order to thrive or, in some cases survive. Larger operations such as Stone Brewing, Green Flash Brewing and Karl Strauss Brewing have all had to adjust course as consumer preferences shift to smaller, local, independent breweries, and active consumer demographics begin to skew toward younger factions, many of which have only ever drunk craft beer. It’s to be expected of interests that are among the country’s 50 largest brewing companies. Though it is considerably smaller and, at its heart still a family-run business, Coronado Brewing Company has been quite vigilant over the past several years, keeping an eye on the rapidly changing market and making moves to weather an uncertain storm. The latest of those moves includes today’s announcement that CBC will purchase East Village-based brand Monkey Paw Brewing. Owner Scot Blair‘s other businesses, South Park Brewing and Hamilton’s Tavern, are not part of the deal. Blair has had lofty aspirations for his beer-making business since opening it in 2011, but was not satisfied with progress toward increased production and distribution. He examined a number of options for meeting those goals, including acquisition, but says he wouldn’t have sold to just anybody. A stalwart figure within the craft-beer world for more than a decade, Blair knows the industry and the individuals within it, and says it was his long-standing respect for and friendship with CBC owners Ron and Rick Chapman that distinguished this as the right move for him and his business. Another key factor is control. Blair has a vision for Monkey Paw and its beers, and will remain intimately involved with the brand, focusing solely on beer—conceptualization and growth of the entire portfolio. This deal is reminiscent of Green Flash’s 2014 acquisition of Alpine Beer Company. That move allowed for increased production of Alpine beers at Green Flash’s much-larger brewing facilities. 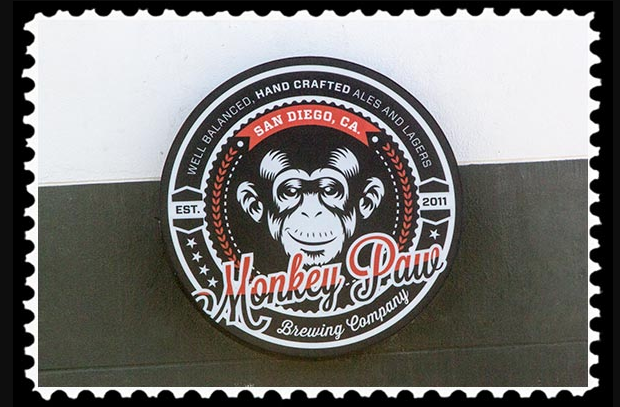 Likewise, Monkey Paw, which produced less than 700 barrels last year, will now have the majority of its beers produced at CBC’s Bay Park headquarters, while still making beer on the 15-barrel system at its East Village pub. CBC began brewing its beers at that site—affectionately referred to as “Knoxville” for the street it occupies—in 2013, a year after taking over the 14,000-square-foot property. Since then, it has taken over several other buildings bordering the brewery, creating a rather impressive cul-de-sac campus. CBC is also in the process of installing a kitchen at Knoxville to increase the draw of its tasting room. This is particularly important with the impending arrival of a satellite tasting room from Benchmark Brewing Company and a new brewery, Deft Brewing Company, slated for arrival in Bay Park this year. CBC is also changing up its game in the southerly municipality of Imperial Beach. The company opened a bar and restaurant there in 2014, and recently signed on to construct a 7,500-square-foot brewpub at the upcoming Bikeway Village on Florence Street. This will increase brewing capacity in a more high-profile location not far from CBC’s original brewpub on its namesake island. Meanwhile, CBC has ceased distribution to certain states, strategically tightening things up to better compete in the marketplace and maximize profits and expenditures. And two months ago, the company announced the Chapmans’ investment in SouthNorte Brewing Company, a new venture headed by CBC head brewer Ryan Brooks. That operation, basically a CBC offshoot or sub-brand, will meld the brewing cultures of Baja California and Southern California, but there’s more to that fermentation fusion than mere ingenuity. An MO like that figures to appeal to demographics CBC does not currently reach in as great a quantity as they would like. Ditto Monkey Paw’s liquid wares, which skew to a younger demographic more interested in locavorianism, that likely wishes to support an edgier brand versus a company that recently celebrated its 21st anniversary. While this acquisition (which is set to be completed by September) may seem odd to those not paying attention, a look at CBC’s recent body of work where business-model adjustment is concerned shows the logic behind it and how it fits into a large and intricate puzzle. : PillartoPost.org Daily Online Magazine is a media partner of West Coaster Craft Beer News & Website. Both are based in San Diego, CA.